Fluffy pancakes are one of the most underrated breakfast foods – in our humble opinion. A bit of butter, syrup, and fruit atop those golden-brown stacks can often be a magical combination. Here are 6 of our favourite places in the city to get fluffy pancakes. Fat Cat’s Cafe in Wanowrie is one of our go-to options for hearty breakfasts and comfort food. 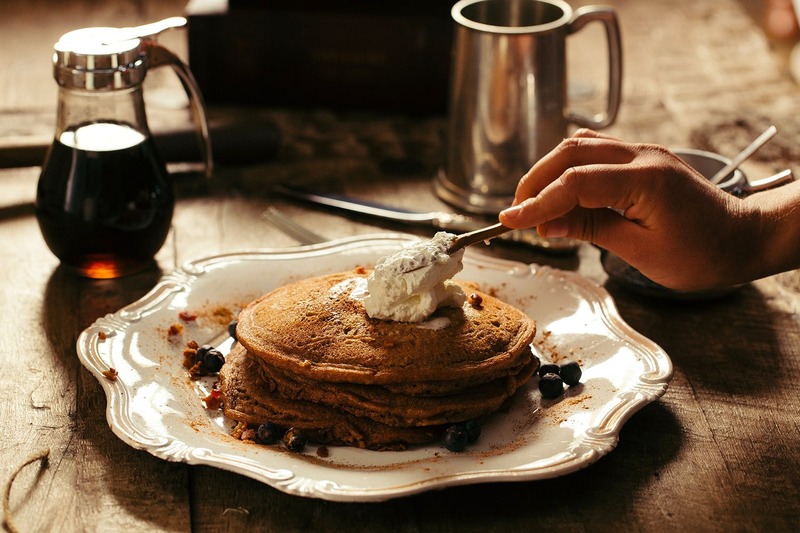 On their all-day breakfast menu, they serve two kinds of indulgent pancakes with a ‘Fat Cat’s twist’: cinnamon roll pancakes – buttermilk pancakes swirled with a cinnamon crunch and served with a cream cheese glaze, and hot chocolate pancakes – chocolate pancakes served with a rich chocolate sauce. On special request, they can also make churro pancakes and banoffee-style pancakes – which we’re huge fans of. Remember to wear your stretchy pants! The Daily in Koregaon Park serves a special pancake menu every Wednesday evening, from 7.00 pm onwards. The standouts (for us) from this menu of 6 varieties are the ‘Mama’s Fatcakes’ – a divine combination of Nutella, sea salt, chocolate chips, and wild-berry compote; and their ‘tipsy pig’ pancakes, served with bananas and bacon. To wind up ‘Pancake Wednesdays’, The Daily hosts a special ‘Rhythm & Pancakes’ event, with a live music performance from 9.00 pm onwards. One O Eight Cafe just re-located to a new space in Koregaon Park, and are working on adding to their already extensive menu. We love their house-made ricotta pancakes – made with organic whole-wheat flour and eggs, served with fresh seasonal fruit and spiced sugar syrup. They’re fluffy, filling, and oh-so-good. If you’re gluten-free, they even have pancakes made with organic ragi flour and no egg – served with the same toppings. Yolkshire in Aundh is famed for their egg specialities, but don’t discount their sweeter offerings! They serve three types of pancake stacks – one with the classic combo of butter-and-maple syrup; ‘chocoburst’ pancakes served with chocolate sauce, chocolate chips, and whipped cream; and plain, golden-brown fluffy pancakes – with a side of chocolate sauce or maple syrup. You can also add-on extra toppings like fresh fruit, ice cream, etc. (at extra charge) if you really want to make a treat of it. The French Window Patisserie in Koregaon Park makes nachni-oat pancakes, with different toppings. Choose from ‘apple pie’, blueberry-lemon, peanut butter-caramel, banana-Nutella, or chocolate with strawberry/cherry. Whichever combination you choose – it’s sure to be lip-smacking good! The Flour Works in Kalyani Nagar is one of our favourite places for classic American-style pancakes. We prefer them plain and fluffy, smothered with butter and honey – but you an also opt to eat them with chocolate syrup, fruit compote, blueberries and lemon mint syrup, Nutella and peanut-cashew brittle, or fresh fruit and honey.